This page goes over the features available on the Markersets pane. 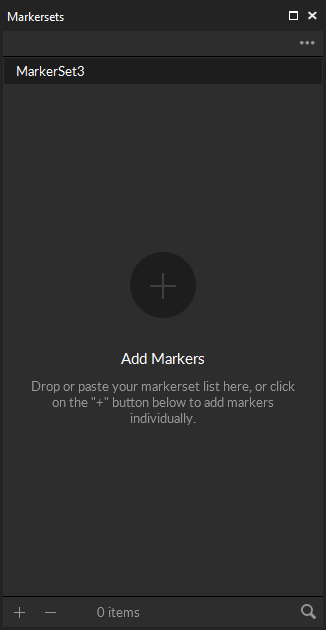 Markersets pane can be accessed by clicking on the icon on the toolbar. Labeling using marker set. This video uses Motive 1.10. Creation of the MarkerSet may be slightly different. The MarkerSet is a type of assets in Motive. It is the most fundamental method of grouping related markers, and this can be used to manually label individual markers in post-processing of captured data using the Labeling pane. Note that MarkerSets are used for manual labeling only. For automatic labeling during live mode, a Rigid Body asset or a Skeleton asset is necessary. Since creating rigid bodies, or skeletons, groups the markers in each set and automatically labels them, MarkerSets are not commonly used in the processing workflow. However, they are still useful for marker-specific tracking applications or when the marker labeling is done in pipelines other than auto-labeling. 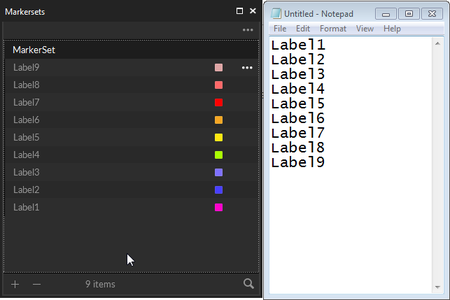 Also, marker sets are useful when organizing and reassigning the labels. 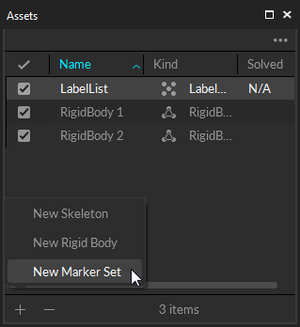 To create a MarkerSet, click the icon under the Assets pane and select New Marker Set. 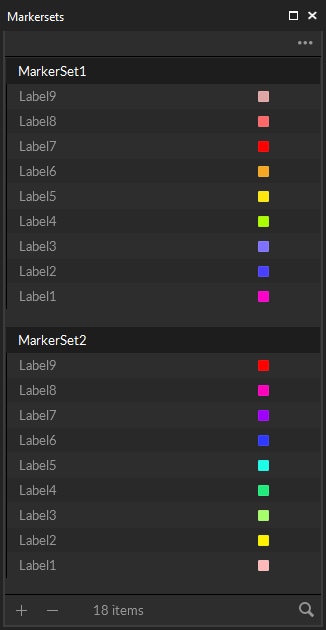 Once a MarkerSet asset is created, its list of labels can be managed using the Markersets pane. First of all, markerset assets must be selected in Motive and the corresponding asset will be listed on the markerset pane. Then, new marker labels can be added by clicking the Icon. If you wish to create multiple marker labels at once, they can added by typing in the labels or copying and pasting a list of labels (a carriage-return delimited) from the windows clipboard onto the pane as shown in the image below..(Press Ctrl+V in the Marker List window). Move the selected label to the top of the labels list. Move the selected label one level higher on the list. 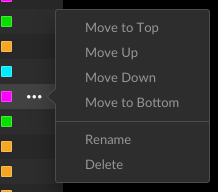 Move the selected label one level lower on the list. Move the selected label to the bottom of the labels list. This page was last modified on 24 April 2018, at 17:14.